Hi-ya friends!!! 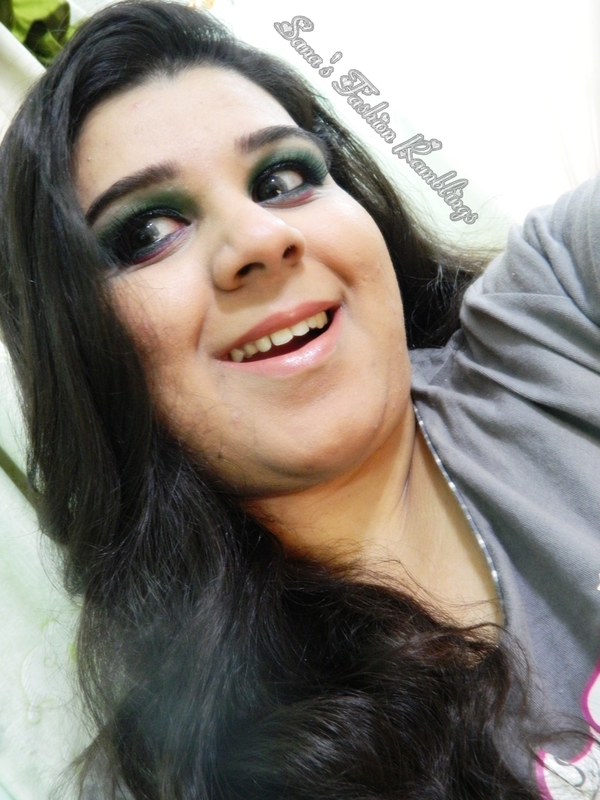 I was actually waiting for Sunday to post this looks as its St. Patrick's day today and I thought it ll be perfect day to share it with all my bella's <3. 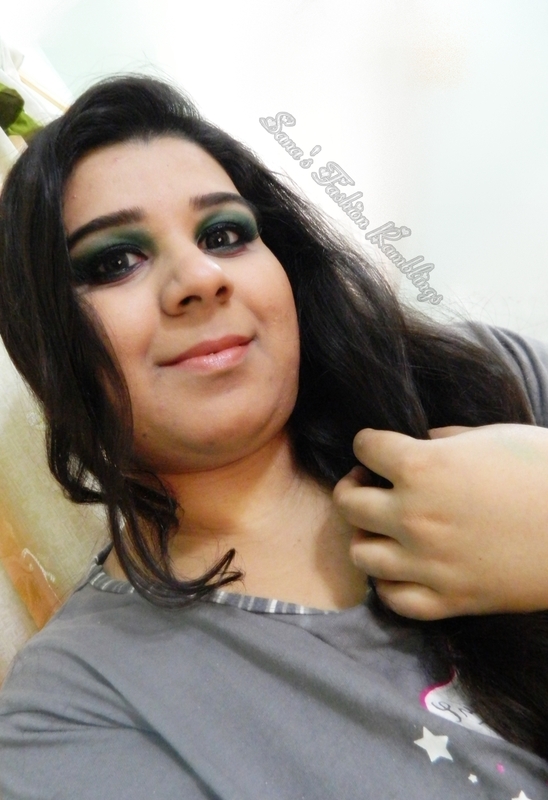 I've got a lot of requests to post the tutorial of How To Rock The Green Eye Shadow Look as soon I publish it. Most of the comments and even on e-mails I've got requests to post the full look and the response was tremendous I never thought of getting that much appreciation and love. 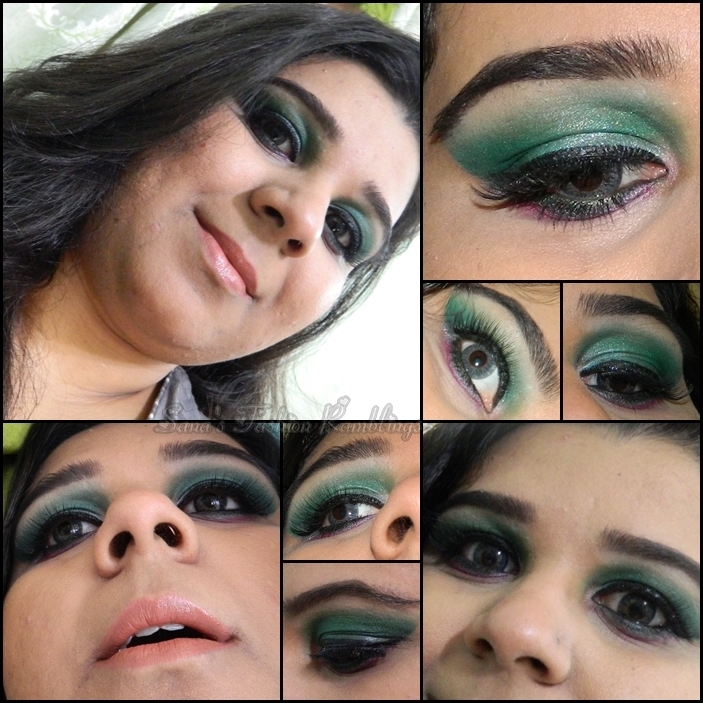 So here it is but I have just changed my crease color with another shade of green instead of Jade Green as that was in my previous look to create a intense crease. In case you've missed it, you can check it out Here. Prep and prime your lids and lash line and let it set. Apply NYX Jumbo Eye Pencil in Rocky Mountain Green all over the lid and blend it well it crease. Using a flat brush and apply dark green metallic eye shadow to the outer 1/3 of the lid and to the lower lash line. Using same brush and use the edge of flat brush to outline your crease. Clean off the same brush and apply shimmery teal eye shadow to the rest of the lid generously focusing on the center. Blend out harsh edges well using short strokes. Take a very small amount of matte black color to the outer edge and take it up to crease and blend well. 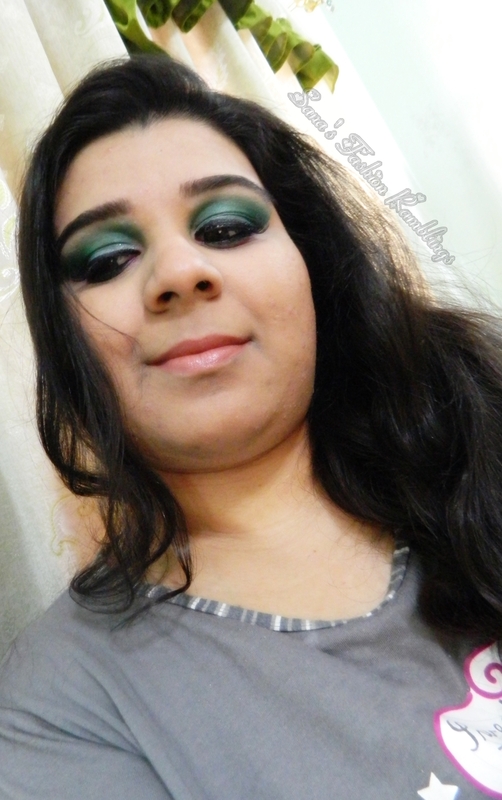 This will define the crease line and will increase the intensity of bright green color. Use matte white shade on a angled brush and highlight brow-bone and blend the transition color. Use pink metallic shade to highlight the inner corner with a shimmery vanilla shadow. Use bright pink pigment on small angled brush to line the lower lash line and extend. 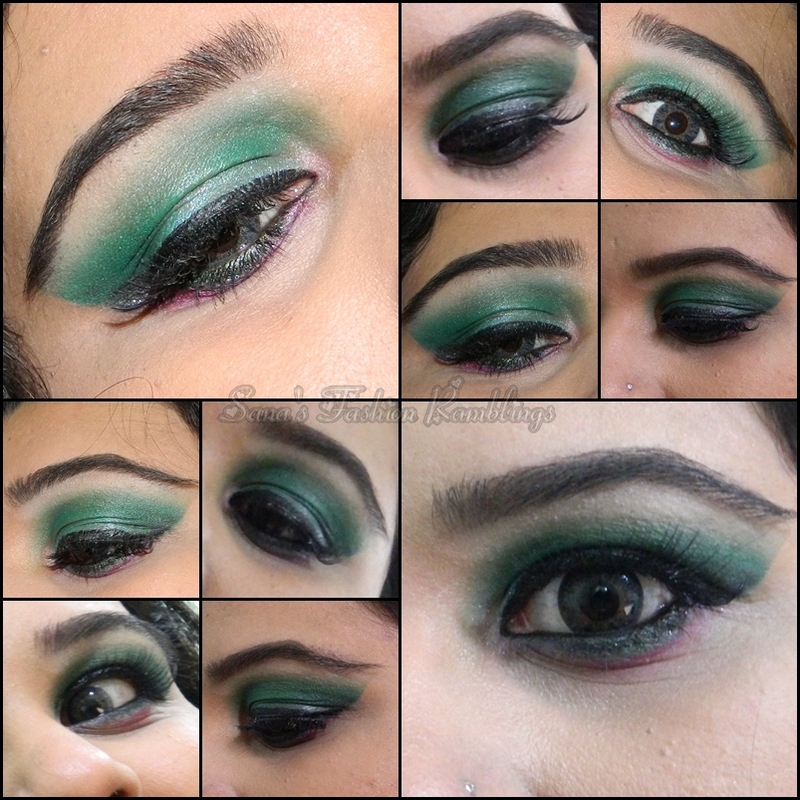 Line the waterline with matte black kohl pencil or with dark emerald green pencil. Apply eyeliner, mascara and falsies (optional) and complete the look. For more detailed guidelines and information, click here . Beauties Factories 120 Color Eyeshadow Palette 1st and 2nd Edition. Inaz Loose Pigment in Euphoria. Bobbi Brown Gel Eyeliner in Black Ink. Model 21 False Eye Lashes No.2T. W7 Primer Magic Camera Ready Face Primer. Rouge Bunny Rouge Skin Sanctuary Time Defying Foundation in Wheat Cream. Beauties Factory 15 Color Camouflager Concealer Palette. Mineral Hygienics Sheer Perfection Matte. MAC Sheer-tone Blush in Peaches. Color Studio Professional Pro Blush in Natural Glow (as highlighter). Elf Long Lasting Lip Liner in Natural Blush. Elf Essential Lipstick in Fantasy. 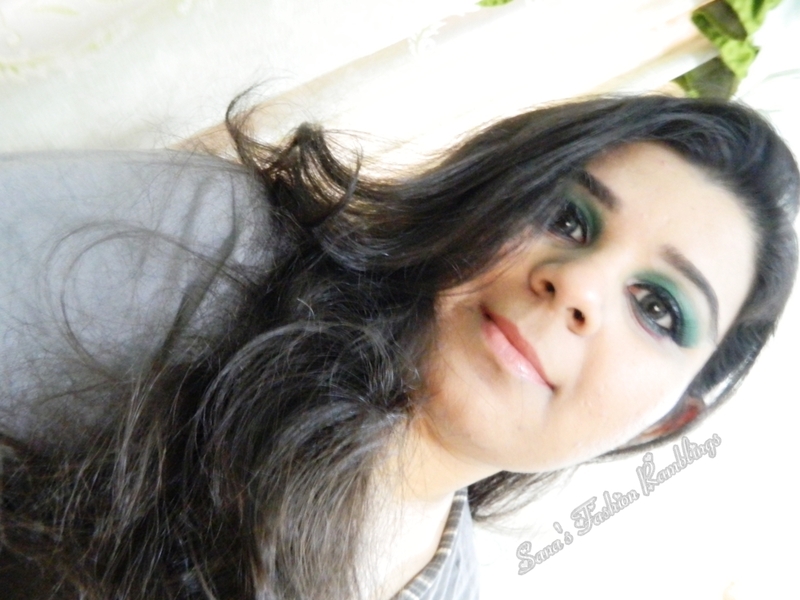 18 comments on "How To Rock The Green Eyeshadow Look [EOTD&FOTD]"
Great post! Green is one of my absolute favourite colours, so I love this look. beautiful look & pix sweets ! Girl, you are making me jealous, I am a great fan of green eye shadows and I can't keep my self buying green eye shadows.. loved your green eye makeup and it made your eyes pop, goes well with your beautiful green eyes. These look lovey! I am using inexpensive terrible styling Cosmetic brushes at this time, really need to invest! Thanks!